Please note: there are no returns on cut clear vinyl tubing so please be sure you are ordering the correct size and length. The price you see is the price per foot on the custom length clear hose tubing. Thank you. 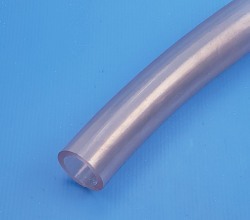 1" ID by 1-1/4" OD Clear PVC tubing by the foot. 1/8th wall thickness. Non-toxic, FDA approved for use in USDA meat and poultry plants.